Fire Magic Aurora Collection, a grill of superior design and engineering--crafted for cooking versatility, durability and long life. 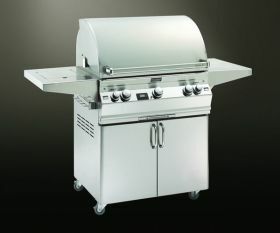 This is the perfect choice for large families and for the gourmet who wants the entire meal prepared at the same time. Stainless Steel Housings are warranted for as long as you own your Fire Magic Grill. Fire Magic Brass Burners, Brass Valves, Backburner Assemblies (except ignition systems) and Manifold Assemblies are warranted for fifteen (15) years. Fire Magic ignition systems, electrical components (including lights and thermometer) and grill accessories are warranted for one (1) year.